As promised, I thought I would introduce you all (in case you haven't been introduced already) to the Scandinavian Music Group! 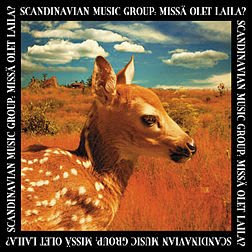 I am always on the lookout for new music to expand my itunes library and I was actually introduced to Scandinavian Music Group (SMG) about a year ago by, Tomi, a Last.fm friend of mine. I never thought I would meet another person who listened to the same unhealthy amount of Rajaton and Billy Talent as I did... but lo and behold... my musical twin lives in Finland! He directed me over to the Scandinavian Group's Myspace page so I could check out some of their tunes myself (since they are similar in folk flavour to some of Rajaton's offerings) but I quickly ran into a barrier... I could not find their Missä Olet Laila c.d anywhere! Not at the Gramophone music store and not even itunes! It was so sad. For a year I tried to satisfy my musical curiosity with the short clips they posted on their myspace page but I did not have access to the entire songs. Thus, I made it a top priority of mine to purchase their c.d. 's when I visited Helsinki last month. One would think that finding a c.d. store in Helsinki is easy but it is not... at least not for me. I am not sure if it was because so many stores were closed that weekend because of the Midsummer Festival when Finns party all night long... or c.d. stores just aren't that common. I asked a clerk in a shoe store where I could buy c.d.'s. She said Anttila and that it was just around the corner. Great. Off I go to to find it. In my mind I was looking for a large HMV/Virgin Megatore type c.d. store... nothing. I go into a convenience store and ask if there is a c.d. store. He says all the stores are closed. I looked at him suspiciously... sure, places are closed but the majority of downtown was open for business. I go inside a shopping mall and ask the info desk, surely a shopping mall would have one music store? The info attendant says no. One thing I found with my short experience with Finnish customer service is that you have to pry them open for answers. You ask them one question they just give one short answer. They don't just spill everything to you, which is fine, they are still polite. I feel it is due to that fact that Finns are more reserved at times so they can come across being a bit more pointed than I am used to when they answer me. However, sometimes you just want them to give you just a bit more info to help you out. I asked her if there were any other c.d. stores nearby. She thought for a moment and said that there are some c.d. 's in the basement of Stockmann's. Excellent. Stockmann's was the massive department store kitty corner to me so I headed over. In the Stockmann's basement I was faced with a decision I was not expecting to encounter. The SMG has 5 c.d. 's available... except that the Missä Olet Laila c.d. I wanted was out of stock! With a deflated spirit I gazed at the slighted dated album covers from their early 2000 musical offerings contemplating whether or not I should compromise but I couldn't bring myself to purchase them. I'm sure they were lovely but I really had my heart set on that one album. It is like getting halfway through Harry Potter the Philosopher's Stone when, suddenly, the rest of the pages are blank and somebody tells you that you should just read Harry Potter and the Deathly Hallows since Rowling wrote both of them so they both should have the same literary flavour. Rubbish! I ask the Stockmann clerk if there was another c.d. store. She then said that Anttila had about the same c.d. selection and I could try there to see if they had the c.d. I wanted in stock. Anttila! The c.d. store name the first shoe store clerk told me about. This time I asked more specific instructions. She said that it was down the street (o.k, so I was on the right track) but that I had to go down into the metro concourse level since there was a mini shopping area underneath the main street. I would have never thought to go underground to find the store. Rolling my eyes with relief I thanked her and continued my journey. I headed down into the slightly seedy Helsinki metro area and perused the closed stores. I saw a few small indie style c.d. shops but they were all closed. I looked out for an Anttila sign. Nothing. I did another round and at the end of a corridor I thought I would head into a drugstore and ask somebody if they heard of Anttila. As I headed towards a store with a prominent cosmetics display in the window, I looked more clearly at the dark signage and could finally see "Anttila" written above me. Finally, I had found it! I headed in and asked an employee about SMG and he directed me to the end of the c.d. aisle where all of their glossy new albums were on display. However, the one I wanted wasn't the new one... it was the second newest so he directed me to a side table display with discounted c.d.'s. There lying in the corner were their 4 older c.d. 's and the deer cover of the SMG c.d. I had searched for. Then I was faced with another choice... what other album should I purchase? (there was a special on the discounted c.d. 's where I could buy 2 for 15 euro). Without too much thought, I just settled on the third newest one and I decided to hold off on their newest album for now. Miraculously, the c.d. 's were not crushed as I tossed my massive backpack around with me on the rest of my travels and I was finally able to listen to them when I was safely back home in Canada. Missä Olet Laila did not disappoint! I quickly became a fan of Vieläkö soitan banjoa? (Do I Still Play Banjo? ), Itkevä lintu (The Crying Bird), Rauhan laulu (Song of Peace), Tahdon uudet silmät (I Want New Eyes). But the first two listed are by far my favorite. It is hard for me to explain why I gravitate towards particular songs; however, usually I am a sucker for a sad folk sounding melodies. Something just resonates within me and increases my musical attraction towards certain pieces of music. They just sound so good to me. Upon discovering my favorites, I sent Tomi a message telling him my choice songs. In a way I was not surprised to hear that the first two songs I listed were his favorites as well. In previous discussions, we had compared our favorite Rajaton albums and songs on Kevät and we matched up perfectly. If that kind of specificity is not evidence of musical compatibility I don't know what is! As well, he also informed me that his favorite albums were the two I had purchased! Props to me for making good consumer choices! This post has turned more into travel commentary post but I hope you enjoyed the backstory to my musical discovery of SMG. I traveled long and hard to possess their music so please take a listen to one of my favorite songs: Vieläkö soitan banjoa? and thank-you to Tomi for all the Finnish-English translations! and the sun is shrinking. and the girl is beautiful and kind. so why would I stand up? I lost you long time ago. you want to forget it all. You ask me, have I cut my hair? that I'll sing to you. Beautiful music. Thank you for posting now that I now there are still beautiful music out there. I came across your blog looking for news about SMG. I'm a fan, from Mexico. I love that translation of Vielako Soitan Banjoa? I've never had it so clear before! What do you think of the new album?? My Finnish friend provide the translation so I am grateful for it. I have yet to listen to the new SMG c.d. but I hope I will be able to soon!